I’m all for fancy products, but I do love it when you find some really, really nice products that are cheap as chips. I have three that have become daily essentials for me, & thought I’d share the awesome bargains. – Lacura Aqua complete serum (£3.49 for 50ml – link!) This was something I popped into my basket when doing the weekly glamorous shop at ALDI… I saw hyaluronic acid and was sold. A hydraluron dupe? The texture is completely different, but ultimately does the same thing. It makes my skin feel plumper and softer & I have noticed a decrease in dry patches on my foundation in the month I’ve been using. Check it out! – ELF Maximum coverage concealer (£3.95 – link!) I bought this when ELF had one of their 50% off deals which made it even cheaper… keep your eyes peeled. I have the shade porcelain, and it’s a good match for my skin. It is really creamy and moisturising, and really does cover well. I have found it particularly good for under eye circles & it doesn’t crease on me. It lasts a long time on the skin, and is basically an awesome concealer. You also get loaddds of product. The only downside is that the packaging means a lot comes out in one go, but I’m not too fussed. – Garnier Simply essentials soothing toner (£2.99 – link!) 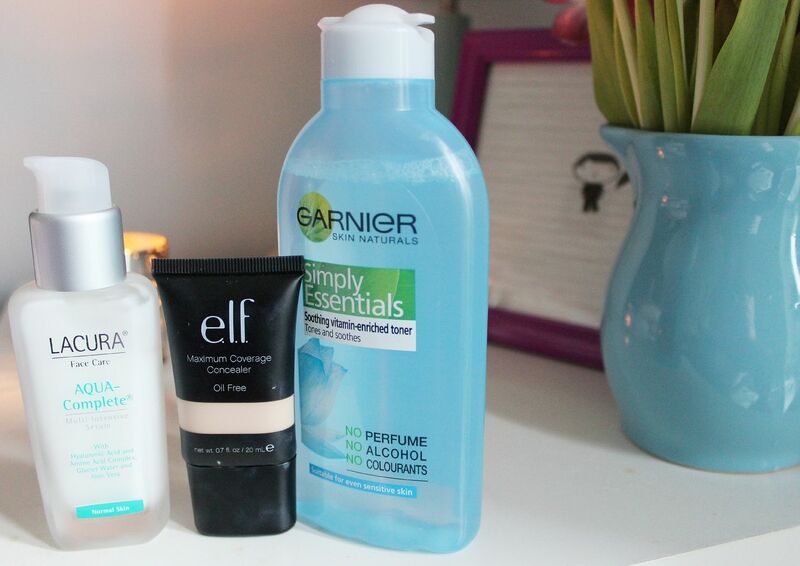 After finishing my third bottle of my Clarins toner, I was on the hunt for something cheaper. I actually picked this up from Savers (super cheap toiletries and cleaning supplies shop) on a whim, but I have been loving it. It has no perfume, alcohol or colourants and is perfect for sensitive skin. I don’t think toning is an essential step, but I personally love the soothing sensation, and the extra moisture it gives my skin. I will be using this from here on out, it’s gooood.